UPDATED 3/23/2016 to remove bizarre symbols that were added in the most recent WordPress update. My apologies if you’ve had difficulty reading this tutorial in the past month — I was unaware that there was an issue until this morning. This quilt block is very simple to make with little waste and lots of opportunity for variation. Please feel free to contact me at epoplin (at) gmail (dot) com or @epoplin on Twitter if you have questions/suggestions about the pattern so I can improve the tutorial. 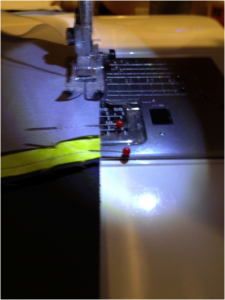 – set aside remaining piece of this strip. Repeat same cutting instructions as for Light Solid. 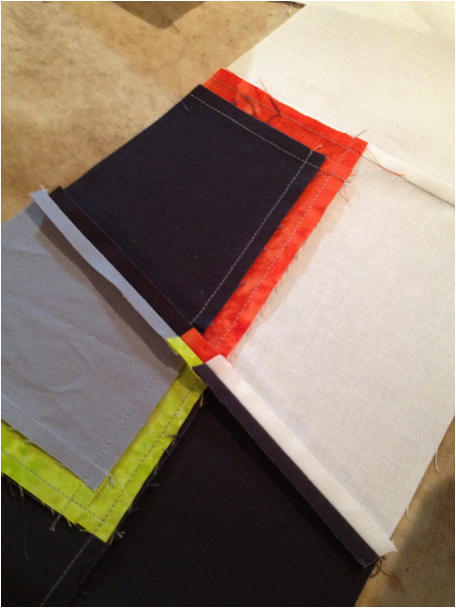 plus the 30″ multi-colored bright 1″ strips cut into 4 pieces each. plus the 30″ multi-colored bright 1″ strips, cut into 4 pieces each. All seams should be scant ¼” seams, fabrics sewn right sides together. Seams should be pressed open or pressed to one side, whichever is your preference. STEP ONE. 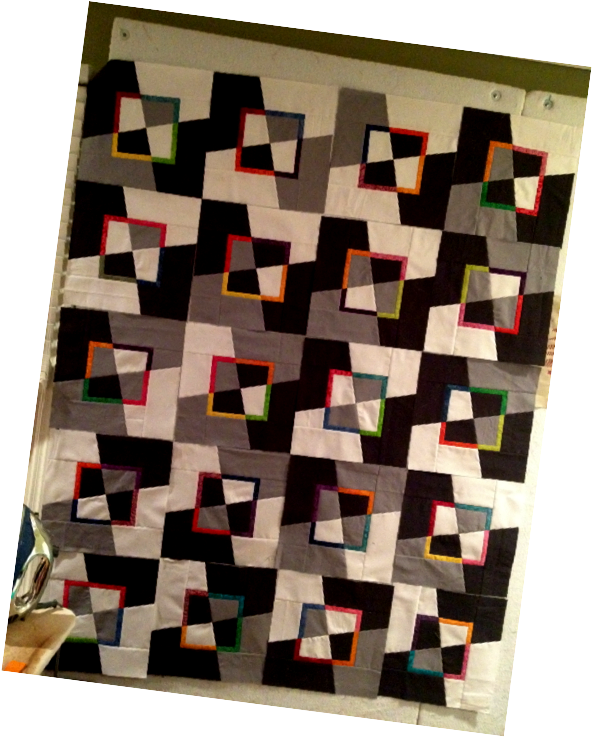 To each Light Solid 6.5″ square, sew same-color bright 1″x6.5″ pieces on opposite sides, as shown in Fig. 1 below. Press seams according to your preference. To each of the above units, sew same-color bright 1″x7.5″ pieces on the top and bottom, as shown in Fig. 2 below. Press seams according to your preference. 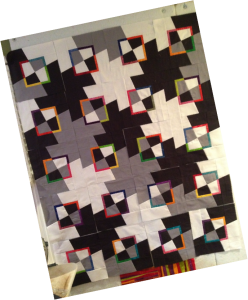 Repeat for each of the Dark Solid 6.5″ squares. STEP TWO. 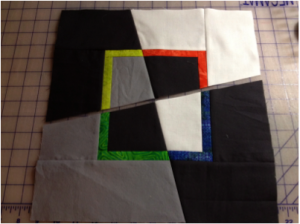 To each of the Light Solid-centered pieced units from Step One above, sew 3.5″x7.5″ Dark Solid segments to opposite sides, as shown in Fig. 3. Press seams according to your preference. 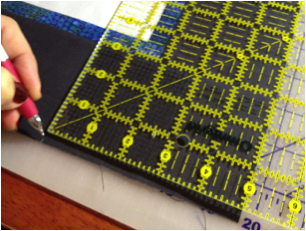 To each of the above units, sew 3.5″x13.5″ Dark Solid segments to the top and bottom, as shown in Fig. 4. Press seams according to your preference. Repeat for each of the Dark Solid units from Step One. STEP THREE. 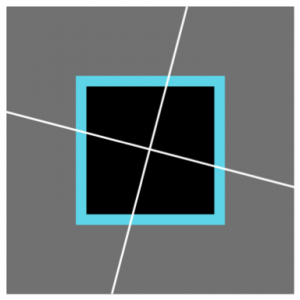 With a Light Solid center block in front of you, make a mark 5″ to the left of the lower right corner, as shown in Fig 5. 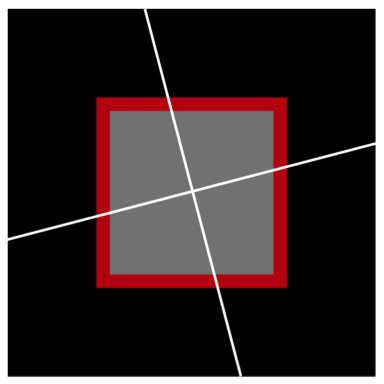 Rotate the block in either direction and make the same mark in the same position for all four corners (always 5″ in from the right corner). 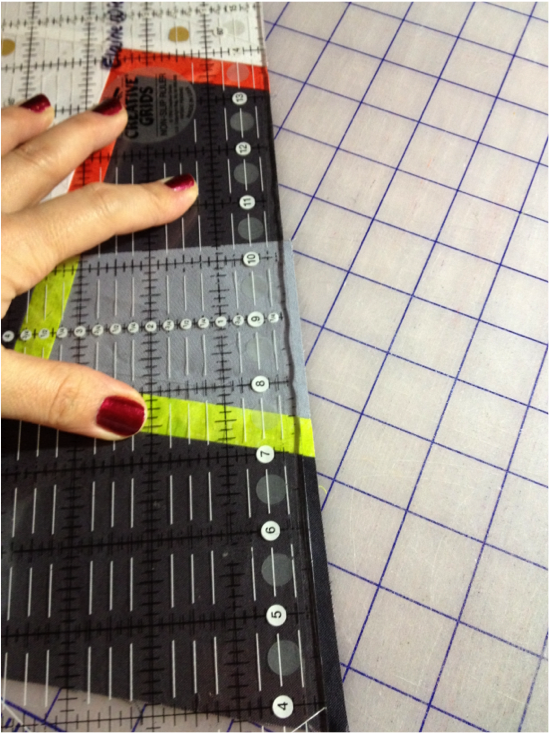 Using an 18″ (or larger) quilting ruler, cut the block from a marking on one side to the marking on the opposite side. Without moving the block between cuts, make a second cut joining the other two marks, as shown in Fig. 6. 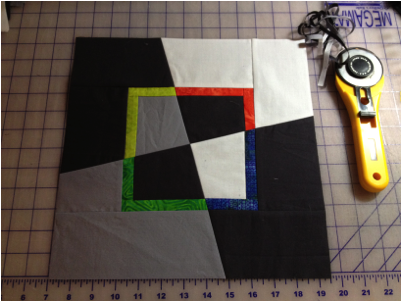 ALTERNATIVE CUTTING INSTRUCTIONS : Cut half of your Light Center and Dark Center blocks as above, but cut the rest by making marks 5″ to the right of the lower left corner, i.e. cut the MIRROR IMAGES for half of your blocks, as shown in Figs. 7a and 7b below. This will not work for the wall-hanging size, as you need at least four blocks cut in each direction for the design to work. STEP FOUR. When all of your blocks are cut, it’s time to play! 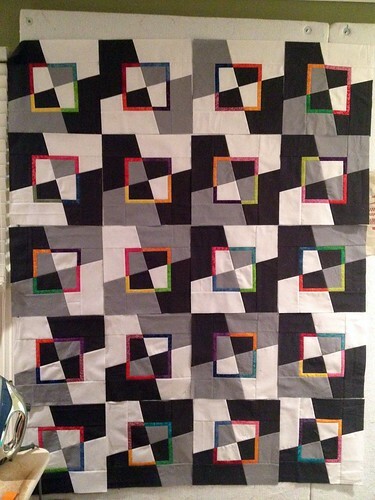 All of the pieces are (hypothetically) the same size, so you’ll be creating new blocks by mixing and matching the cut pieces and sewing them together. 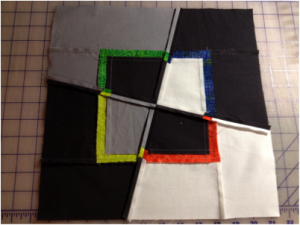 Pin two adjacent quadrants together, matching the thin contrast strips at the seam allowance. IT IS OK if the centers and edges don’t match perfectly at this point; you will be trimming them anyway. Sew the pieces together, starting on the INTERIOR SQUARE (the gray part in Figure 9) and working out to the outer edge, as shown in Figure 10. Press seams open to reduce bulk, as in Figure 11. At this point, you will probably notice that the edges of the interior square do not line up exactly. This is fine! We will just trim it straight before proceeding to the next step as in Figure 12. 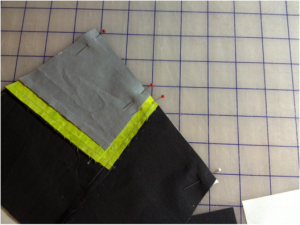 Match up your sewn halves, matching the centers and the contrast bright strips the best you can, being very careful with the bias edges (Figure 13). Sew the block and press the seams open (Figure 14). TA DA! Here’s the finished block. 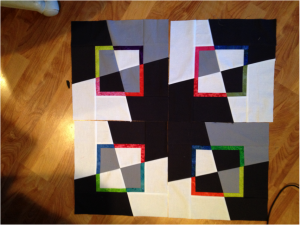 It’ll measure about 13″ unfinished, but none of the edges will really be perfect so it’s time to trim! You can carefully trim the blocks to 12.5″ unfinished for the effect I have in my samples, or to any other size larger than 8.5″ (smaller than that and there won’t be much of an effect). Your squaring can be straight or wonky, depending on the size square you choose. The smallest wonky block you can cut will be 9.5″ unfinished, or you’ll cut into the contrast strips. Here’s one arrangement I came up with after getting a few blocks made. 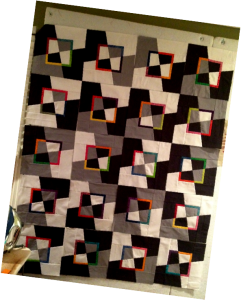 This is the wall-hanging size. All of these blocks were cut the first way. Using the Alternative Cutting option and cutting mirror images would provide a very different (and cool!) look and I can’t wait to try it! Then I started playing on my design wall. 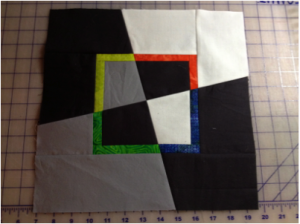 And here’s one with the Alternate Cutting instructions… I discovered that with the AC instructions you MUST HAVE MULTIPLES OF FOUR BLOCKS or it won’t be as easy to distribute your colored strips. The possibilities are endless! 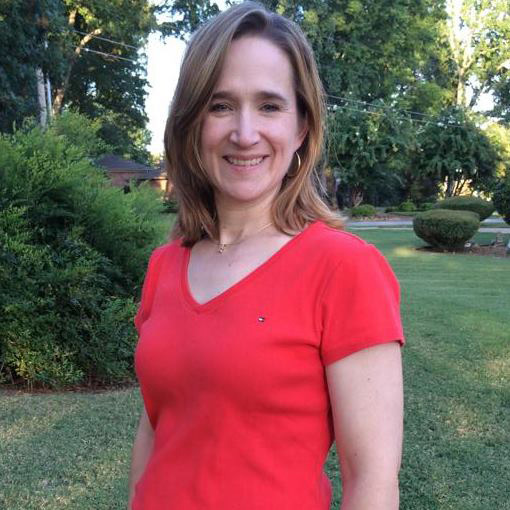 Let me know what you come up with! What an interesting block. Your tutorial was very helpful and I can see many fun tips to try in my future. Thank you. 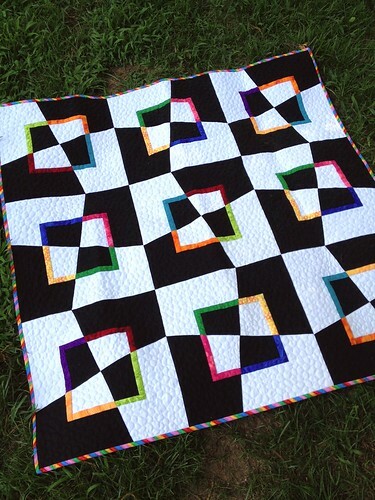 How very generous of you to share this spectacular quilt. Your instructions are so clear that I am ready to make this NOW! Love it. Hello! I very much want to make this pattern, I want to start it yesterday! 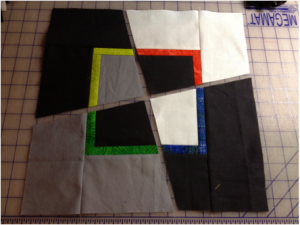 The bottom photo, set 3 x 3 blocks, striped binding – is this done with the mirror image blocks? Or done the original way? Just now seeing this… The 3×3 original pattern is done with the mirror image blocks. I made 12 blocks and just used 9 of them.